This lesson explains what are parallel and perpendicular lines and has varied exercises for the students. The lesson also includes a video where I show how to draw a perpendicular line and a rectangle using a protractor or a triangular ruler. Two lines or line segments can either intersect (cross) each other or be parallel. Think of the parallel lines as never meeting each other, no matter how much you would continue them to both directions. We say two lines or line segments are perpendicular if they form a right angle (or several right angles). We can mark a right angle with a little corner . do lines u and t form? parallel? Continue the lines with your ruler. 2. Which line segments in these figures are parallel? Which are perpendicular? In the video below, I show you how to a right angle (or a perpendicular line to a given line) using either a protractor or a triangular ruler. I also show how to draw a line perpendicular to a given line through a point on the line, or through a point not on the line. Lastly, I draw a rectangle with given side lengths, using a protractor to make right angles, and a regular ruler to measure the sides. First, draw a point on the given line. Next you will need a protractor or a triangular ruler. Align the dot and the straight side of your protractor. Also align your existing line and the 90° mark on the protractor. Align the inside edge with the given line. Align the dot with the outside edge. 3. Draw perpendicular lines through these points. 4. Draw a line that is perpendicular to the given line and goes through the given point. ruler to make sure the lines you draw are perpendicular to the existing lines. 6. a. Draw here any triangle that has a right angle. It is called a right triangle. b. Find the perimeter of your triangle in centimeters/millimeters. Draw a line that is parallel to a given line. Method 1: A ruler. Align the bottom side of the ruler with an existing line. Then draw a line above the top of the ruler. the parallel line to be further or closer to the existing line. Doing that means the drawing may not be totally accurate, though. II. If the line is not long enough, you can continue it using a normal ruler. Then, draw a point on it. III. Draw a perpendicular line. Make that line longer using a normal ruler. All done! I. Draw a point on the given line. Then draw a perpendicular line through that point. 9. Draw a square with 5 cm sides. Hint: first draw a line, longer than 5 cm. starting line that go through those points. these shorthand notations: ∥ for parallel and ⊥ for perpendicular. For example, l ∥ m means l is parallel to m, and AB ⊥ CD means AB is perpendicular to CD. 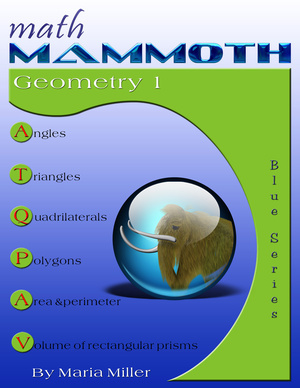 This lesson is taken from Maria Miller's book Math Mammoth Geometry 1, and posted at www.HomeschoolMath.net with permission from the author. Copyright © Maria Miller. A self-teaching worktext for 4th-5th grade that covers angles, triangles, quadrilaterals, cirlce, symmetry, perimeter, area, and volume. Lots of drawing exercises! Download ($6.90). Also available as a printed copy.